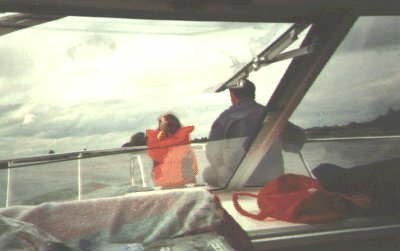 In 1996, Mandy wanted to go to Ireland and I fancied a boating holiday, so we compromised on a week's cruising on the Shannon. We drove down to Wales and took one of the high-speed catamarans to Ireland. From there it was a day's drive, almost back to Northern Ireland. Given the time we'd taken to get to Wales and then the (rather rough) crossing of the Irish Sea. We stayed at a farmhouse overnight, close to Portlaoise. The people were exactly as you imagine Irish people to be. Hospitable, friendly and welcoming. Lauren loved the fact that the daughter took us around the farm to show her the animals and would have happily spent the whole week there. We picked our boat up from Carrick Craft in Carrick On Shannon. Carrick is not a beautiful town (in fact, that was probably the biggest disappointment of the holiday, all the towns we saw were dull and uninteresting and, to the south of Carrick, at least so was most of the scenery), but there is (or at least was) an astonishingly good pizza house, looking all the world like a bog-standard tea and chips cafe there. We took the boat out straight away, but only sailed as far as Jamestown Bridge, before we decided to moor up for the night. The main harbour was full, so we moored up on the entrance to the Jamestown canal. After a reasonable night's sleep and a quick bite of breakfast, we headed for the our first really big challenge; a lock! In reality, this wasn't the huge problem we worried it may be. The biggest problem was getting our 4 berth boat in with the huge boats the Germans loved (Often a lock would consist of our boat and three other, full of Germans, such was the popularity of the Shannon with them). Locks were probably one of the highlights of the holiday as we all (Lauren included, she was in charge of shutting the engine off) had something to do in locks and when mooring (often a tight squeeze). We motored fairly quickly (They give you a full tank and you pay to refill it at the end, we used about £50 worth of fuel in the week), passing Clonmachnois, Athlone and crossing the large Lough Ree, which was like being at sea with a strong wind raising high waves, which threw the boat around, and only buoys to navigate by. We finally stopped at Shannon Bridge, deciding that to press on would leave us in danger of having to rush back. On our return leg we avoided the spots we stopped at on the way down and, after taking a look around Clonmachnois, arrived back at Carrick On Shannon, with a day to spare. After picking up a dingy (at Lauren's insistence), we then decided to go north, towards Lough Key. The maps showed a country park and an area of a number of interconnected loughs. What a contrast to the southern route. This area was much more picturesque, with rolling hills leading into distant larger hills almost big enough to count as mountains. The sun even, finally, came out on this day and we really enjoyed ourselves. However, after a week on a small, damp boat we were ready to go home and it was with a little relief that we returned our boat to Carrick Craft. The following day we drove down the Shannon, covering the distance that had taken 3 days by boat in around 2 hours by car, but that is the beauty of a boating holiday. We spent the final night in a hotel, which is built onto the remains of an old castle, near Wexford. The next day we got back on the catamaran, enjoying the smooth crossing this time and finally returned home. Nigel Freeman posted this report on his remarkably similar trip. In 1997, we had Ryan (yep, a result of the 1996 holiday!) who was only 4 months old, so we decided to spend a week, self-catering on a farm in Wales. Lauren had greatly enjoyed a night's stopover on a farm in Ireland, so we thought she'd have fun (which she did). The farm was simple, but very comfortable. Lauren wanted to take the tatty farm cat, Puss, home (in fact, all their cats are called Puss, but I don't think Lauren understood that) and we tried milk fresh from the cow. The weather was very hot (except for one day when we experienced a torrential downpour when the roads were, briefly, flooded) and Ryan (only a baby, was not happy much of the time. We spent half a day on Pendine beach and took a quick look around the library, which doubled (At the time) as a museum of the land speed record breaking history of the beach. 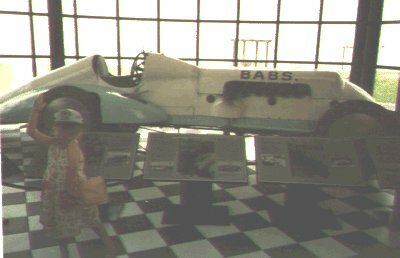 At the time, Parry-Jones' 'BABS' was there, but I'm pretty sure it's now at Brooklands with many other land speed record cars of the era. Parry-Jones was killed, in the car, at Pendine (after having just broken the record) and the car was buried in the sand on the beach, remaining there until the early 90s when it was dug up, restored and put on display. Another day, we went to the seaside town of Tenby, from where we took a boat to the beautiful, peaceful monastery island of Caldy. It really reminded me of some of the monastery towns in Bavaria and Austria (except these monks don't brew beer. Sadly!) 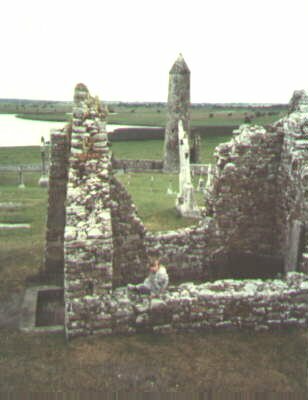 As well as the monastery, the island has an impressive lighthouse which looks out over the expanse of the Atlantic Ocean - Being south of Ireland, there's nothing between Caldy and the US seaboard! 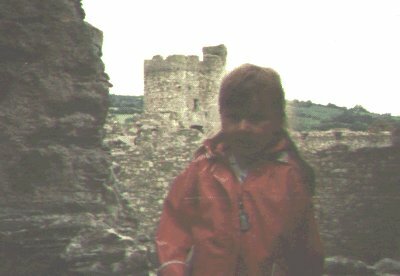 Other days were spent visiting Castles at Kidwelly and Laugharne. This part of Wales has many beautiful castles and at some, less ruined ones, it's easy to imagine the lives of the privileged people (and their servants and guards) who lived in these places. We also visited a dinosaur park near Tenby (Lauren loved it!) and a small, but interesting, Rain Forest centre with tropical butterflies run by an enthusiastic couple. We had a good week in Wales, but the weather was too warm for a baby and that took some of the pleasure from it. 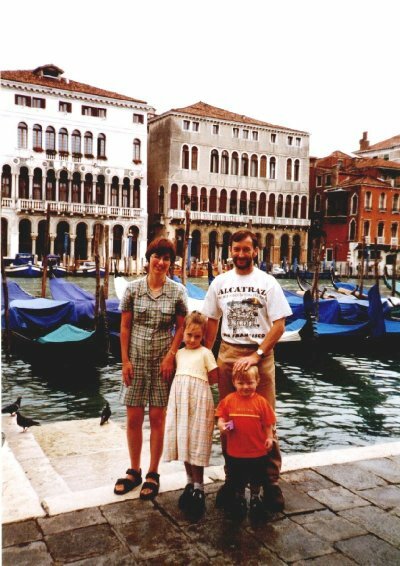 1998 saw us take a lot of holidays. Mandy talked me, against my will, into going to a timeshare presentation, which promised a 'free holiday'. Of course, they tried to keep us for hours and grind us down to buy a timeshare, but, to be fair, they did come up with the goods and offered two 'free holidays'. 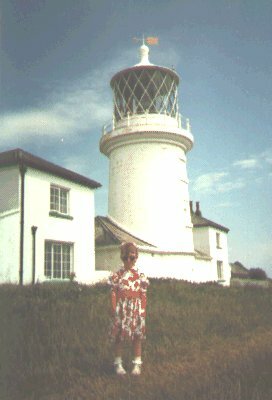 The first was a 4 day break in Cornwall (which we took in May). The second was a week (somewhere! ), which they informed us would be a week before Christmas in Spain! Not good for us, so we ended up paying about £300 for a week in Portugal in October, which turned out to be great. We stayed in a villa and appartment complex just outside Albufeira. The town itself is a mixture of picturesque fishing village and modern, hotel urban sprawl. The complex, however, was quiet, modern and well serviced with two large swimming pools. In October, it was also very quiet and the couple assigned to persuade us to buy (An Englishman and his wife, who turned out to be from Munich) were very relaxed about our refusal to buy and didn't hassle, but helped, us. We toured around the area, in our rented Renault Clio. One day, we visited the castle at Silves. This particular day (or maybe the inland location) was incredibly hot, but the Moorish castle is an impressive sight. Even so, after a quick trip to the supermarket, we were glad to be back in the cool of the complex pool! Another day we took a trip to the 'mountain' at Monchique. Hardly a mountain, by most standards, but it is a very big hill in a notably flat area and stands alone. Going up the mountain, there's a small spa town, called Monchique.., which is an oasis of calm and shade in the heat of the Algarve. This was definitely my favourite place on the Algarve. The view from the top of the mountain was impressive, with commanding views of the surrounding (low lying) landscape, even on a hazy day. It was also surprisingly cool and we were glad to have brought some jumpers with us! One day we drove to the modern golf and hotel complex of Vilamoura and took a trip on a yacht. Mandy's proud of her sea legs, so it was a little surprising that it was her who (of all of us) was close to sea sickness, but she blames it on all the others who found the trip too choppy and succumbed! It didn't help that we spent the first half of the voyage up on the netting overhanging the bow, where the undulating motion of the waves was most profound! We only travelled along the coast from Vilamoura to Albufeira and back and there wasn't enough wind to use the sails alone, so had to run on the engine, but it was still an enjoyable trip. On our last day, we had to return to Faro airport, but our flight wasn't until the evening, so we drove into the old town of Faro. This turned out to be a glorious place, with, by the main cathedral, a square lined with Orange trees. We waited here for an hour or so as a wedding party gathered and Lauren was excited when the bride finally arrived. I really hadn't expected Faro to be such a lovely place, expecting it to be just big town with an airport, but the fact that it sits right on the coast is probably a clue that it has a historic region, given the Portugese history of seafaring. Our flight home was delayed and then our luggage took an hour to get off the plane, back at Gatwick, but the kids (including Ryan, who was still very young) were as good as gold and running around happily at after midnight! Finally, just four days after getting back from Portugal, Mandy and I jetted out to San Francisco for 6 days, taking in the Sportscar race at Laguna Seca along the way. To keep the cost (and to an extent, the hassle factor) down we decided to drive. We have friends in Southern Germany and we arranged to spend a couple of nights with them in the Bavarian Alps, before continuing down, across the Brenner Pass, into Italy. The journey to Southern Germany seemed much worse than I remembered of my trips to Munich when I lived there, so it was with some relief that we arrived at our friend's farmhouse. The house was left to them by an elderly relative and is 2 or 3 hundred years old. It needed quite a lot of work, but Padraig showed me round the recently fitted roof and attic. All the timber used was cut from his father-in-law's forest! Once finished, this house will be lovely and the view, of the Pendelstein, takes some beating. We stayed with Padraig (who is Irish), Gaby (his wife, who comes from this village) and Siobahn (their young daughter) for a couple of nights. On the day in between we walked part way up the mountain next to the village and ate an excellent Grostl (washed down with great Bavarian beer) at the local gasthof. The day we left there, turned out to be the first of a local bank holiday weekend and, whilst the first 20 or so miles were clear, we soon ran into terrible traffic jams, which only intensified as we drove up the Brenner pass. In the end, we couldn't stand the near stationery traffic and joined some (only slightly more mobile) minor roads. These took us through a number of Italian ski resorts, including Cortina D'Ampezzo, but it was late when we finally arrived, exhausted, at the camp site. We signed in and were shown to our tent. Everything seemed quite comfortable, with 3 'bedrooms' (two singles and a double) being separated from the eating and living area. Outside we had space to park the car, hang washing, have a BBQ and veg in the sun. The beach was about 100 yards away. Unfortunately, the first night it rained quite heavily and next morning carried on. Eventually, though it stopped and we ventured out. Over the next week, we spent a couple of half days on the beach, and another couple shopping and at the pool, but most of the time was spent site-seeing. Most impressive, undoubtedly, was Venice itself. Some places are so hyped that, when you get there, they are a terrible disappointment (often just one or two sites with lots of urban sprawl), but Venice is EXACTLY what I expected, or maybe moreso. 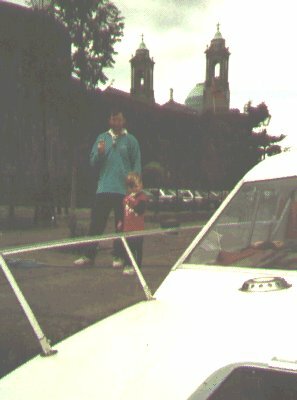 Even the thrill of approaching the town on the ferry (for the campsite was across the lagoon) sticks vividly in my mind. You could imagine ancient traders and explorer seeing the same sites and, probably for many, getting the same feeling of awe and excitement as they approached. All the sights, the Campanile, the Doges' palace, St Marks square, the cathedral, the bridges, the little alleys, the canals themselves (both great and small) were even more beautiful and impressive and, somehow, authentic as you'd want them to be. Even with masses of holidaymakers, you could feel the history oozing out of the place and the weather obliged by not raining too much... Some would argue the lack of modern buildings make it an artificial environment (a bit like an Renaissance Disneyland), but I didn't have that feeling at all, and I'd gone, fully expecting to. Highlights were, for me, the view from the Campanile (and St Mark's cathedral), wandering through the tiny alleys leading away from St Mark's square and the trips on the river buses on the Grand Canal. We (much to Mandy's annoyance) didn't go on a gondola. I suppose we should have, but the cost and the feeling that it was a bit too touristy, put me off (Mandy said I'm just mean...). Another day, we drove back up towards the mountains and spent a few hours in Verona. Famous as the setting for Shakespeare's Romeo and Juliet, Verona was, like Venice, packed with beautiful buildings. These included a Coliseum (used for open air Opera these days) and an impressive castle. After the morning in Verona, we drove the half hour or so to Bardolina on the edge of Lake Garda. I'd been to Lake Garda (and indeed Bardolina) before, but it was nothing but a pleasure to be there, once more. The crowds of Venice and Verona were absent and we wandered around the town and the edge of the lake for some time, before heading back to the campsite. I'll go back to Garda again, it really is a wonderful place to visit and just let the world's worries float away. Another day was spent 'island hopping' across Venice's lagoon. Using the excellent public ferries (from a mile or so away from our campsite), we visited Murano and Burano, famous for their brightly coloured houses. First we visited Murano, famous for it's glass. This is like a mini Venice, with it's own Grand Canal, spanned by many bridges and scores of small shops and factories selling and making glass. In some of them you can watch the glassblowers making the very items you can buy next door, and I, for one, always find glass blowing a fascinating thing to watch, even if some of the results are a little twee for my taste. Burano is famous, in its turn, for lacemaking. I'm told that people pay huge amounts of money to have wedding dresses made of this lace and, certainly, much of it was impressively ornate. However, as in Belgium, my admiration for the skill and dedication of the makers doesn't extend to a taste for the product. Burano, on the other hand, had much to recommend it, being, moreso even than Murano, much quieter and tranquil than the ocean of visitors that is Venice itself. If you are in Venice for more than a day or so, take the ferry out to the islands and enjoy another side to this wonderful place. On our return trip, we stopped for a curry (very German, I know!) at the Rama curry house in Ismaning. Just three stops down from Munich airport on the S8, this is a great restaurant (offering Italian and Indian food - long story, but it's all good), which we much frequented when we lived in Ismaning. 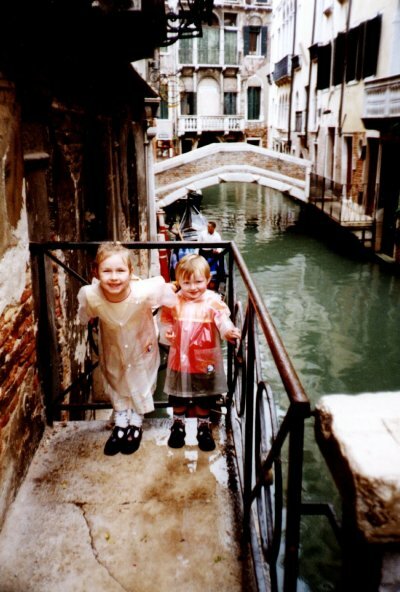 Venice will figure highly on my list of favourite places and places to revisit. Interestingly, everyone I've spoken to about it since my return has said the same, it's just a great as the reputation! The kids love caravanning (Mandy takes them to the Isle Of Wight for a week, most years), so we booked a week in the Vendee region of France, in the May half term. The drive was long, from Calais, but the roads were quiet and we arrived ready for a rest. The campsite was well equipped, with a good pool (with water slides), kids clubs for Lauren and restaurants and bars on site, for those days when you either don't want to cater for yourself or venture into the towns for more interesting fare. The caravan was reasonably roomy for 4 and more comfortable, certainly, than the tent in Venice, but somehow caravans always leave me disappointed. With a tent I expect to be cold and uncomfortable, whereas with a caravan, the lack of space and rudimentary heating and insulation always leaves me feeling that it's not as comfortable as a hotel room or appartment (or home!). The town of St Jean De Monts (perhaps more accurately named St Jean De Vents - ho, ho, multilingual humour!) is on the Atlantic coast of France, about 50 miles south of the bump that is Brittany. In high summer, I expect this is a bustling, sunny, hot location, but it's position leaves it prey to howling winds coming in off the ocean. One sunny day, and we had a number, we decided to go to the beach, but when we arrived, the wind was so strong (and cold) that we did no more than paddle and then jumped back in the car and returned to the haven (and that's who we'd taken the holiday with too, Haven!) of our pool, where the winds didn't penetrate and the sun was able to do it's work unhindered. During the week, we visited a number of local sites, but most were dull to be honest. A local windmill tour was interesting, although all in French and a little difficult to grasp the finer points of and one grey day we visited the island of Noirmoutier, which is reached by a long road causeway. There wasn't a lot to see here on a drizzly May morning, but it will remain in my memory for the exquisite Crab I ate. It was lunchtime and I wasn't planning a full meal, but the Crab Mayonnaise sounded good. I'd obviously not translated the finer points of the menu as what arrived was a large, full crab on a bed of salt, served with Mayonnaise. It was absolutely fantastic - possibly the best tasting and certainly best value, crab I've ever had. Overall, the Vendee in May was OK. The wind made the beach unusable and the weather was variable, with too many overcast and drizzly days. There were, also, not many things to do and see in the area (that we find anyway), but the town has plenty of shops (they seem to specialise around here in reasonably priced models of sailing ships - made of wood and highly detailed - I got one and it looks great on display) and restaurants and I'm sure with summer weather, it's a lot more fun. The campsite (Le Bois Masson) provided good facilities and was far enough away from the beach to make the pool a pleasant place to be, on the sunny days. After quite a good holiday in 2000, we decided to take a later holiday in a caravan in France again in 2001. We went in late August, which turned out to be a great choice. Once again, we had a long drive, to Dover, and then down from Calais, but we found the campsite (The Chateau Gallinee at Matignon) fairly easily and settled in. The site was small and quiet, with a decent pool, right next door to the old Chateau. The caravan was a little bigger than the one we had in the Vendee and there were some open spaces for the kids to play ball games in, which was good. Over the week we ate BBQs a number of times and Lauren enjoyed going down to get the freshly baked Croissants from the shops in the morning and the on-site Pizza joint provided acceptable fare at a fair price. My biggest memory of this holiday was really just relaxing. I don't think I'd relaxed so much (on holiday or elsewhere) for years. The weather was hot all week, the scenery was beautiful and we, on the whole, had a good week, with even the kids being happy. One day we visited a lighthouse at Cap Frehal and then walked along the cliffs to the nearby Fort La Latte. It was a fiercely hot day and it soon became evident that Ryan wasn't going to be able to make the journey back (about 3 miles over rough ground), so Mandy, Lauren and Ryan waited at the car park by the fort, whilst I jogged back (not something I normally do, I hasten to add!) in the extreme heat. It had taken over 2 hours to walk to the fort, but only took me 45 minutes to get back to the car and return to the car park at the fort. On another day, we visited Mont St Michel. Visiting this island is like stepping back into medieval history. Once across the causeway (we parked and walked across, although at low tide, you can park at the base of the mount), you step inside a rising maze of alleyways and buildings. The overriding memory for me was the crush of people, but due to the setting, it felt more like being in part of a medieval pilgrimage than a tourist trap - perhaps an indication that things really haven't changed that much in centuries. We found a little used path and climbed high above the sea. Another day, we visited the beautiful town of Dinan. Much of this town is medieval and, like Mont St Michel (but without the crush) is like stepping back into history. You can walk around the main part of town, enjoying street after street of ancient buildings, climb the scarily steep (and high) clock tower for a fantastic view and then descend down to the famous river port (or just look down on it from the cliff top just outside the town centre). An enchanting place. Most of the week, though, we just relaxed and enjoyed the impressive, coastline and scenery. The beaches reminded me a lot of Cornwall (not surprising considering the Breton/Cornish links) and we had great weather. On our last full day, we decided to visit nearby St Malo. You can take a ferry here and, if you're visiting the area, it's the easiest way to get there from the UK. The centre of the city is ancient and surrounded by a huge defensive wall, which you can walk around. Effectively, the rabbit warren of little streets are within a fort, complete with cannons. The weather, for once on this holiday, decided not to play and it rained, but this wasn't a great problem and we also ate a good seafood lunch in one of the restaurants adjacent to the wall, near the main entrance. Once again, an excellent place to visit and much moreso than a typical port town. Whether it was the weather, my frame of mind or simply Brittany is a great place, my memory of this holiday is all pleasurable. 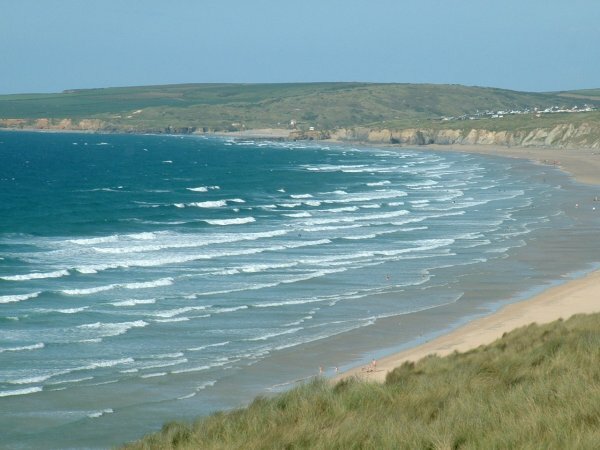 The sun shone, nothing seemed hurried and the towns, beaches, cliffs and countryside were all beautiful. As with Cornwall, Brittany is a place I'd love to return to over and over again. Just after the terrible events of September 11th, it became clear that there were some very good deals to be made flying in Europe. With quite a bit of holiday allowance left, I decided that it would be good to visit Munich again, as we'd not been back to the city since we left in 1995. Go were doing cheap flights and a quick check on their website showed that, even during half term, I could get us all there (and back) for a little over £200. Once I found a hotel to put us up for a similar amount, the decision was made. We left home very early to catch an 8 AM flight, which got us into Munich about 11 AM. On arrival we made our way down to S-Bahn, where I quickly realised how fast language skills fade when not used. When I lived in Germany, although far from fluent, I could hold halting conversations and read most signs, etc with ease, but now I struggled with the ticket machine, before, thankfully, finding one with English instructions. Our hotel was a modern, affordable place, similar to Travel Inns in the UK, which provided clean, comfortable, but plain facilities for a reasonable price. The downsides were that a) we were on the outskirts of town at (Donnersbergbrueke) and b) right by the S-Bahn track. On the positive side, the proximity of the S-Bahn meant getting around was easy and our plans to get a car for a day or two were scrapped when we realised we could do plenty without one. We visited the town centre on our arrival, taking in the Englischer Garten along the way. We walked through, from Schwabing, to the Chinese Tower and enjoyed a couple of beers (whilst Lauren and Ryan enjoyed a Bretzen - a big pretzel - and a Coke). After a reasonable night's sleep, we set off to explore. The U and S-Bahns (plus buses and trams) are accessible on a Partner pass, which works out at great value with up to 5 adults (2 kids = 1 adult) getting a full day's travel for around £10! It's around half that if your trips are staying within the centre (or on the outskirts, as on our trip to Andechs). We were there for 5 days. Mandy wanted to look around all the shops she used to frequent, so, one day, we split up. She went shopping and I took the kids to the zoo. The zoo, like much of Munich, is full of horse chesnut trees, their broad leaves providing much needed shade on hot summer days, but October was surprising mild in 2001 and we welcomed them as we sat in the zoo and ate our lunch. Afterwards, we met Mandy back in town and wandered over to a Pizza restaurant I'd frequently visited in the early days of my stay in Munich, when I'd spent a couple of months in an appart-hotel. Another day, we travelled down to the Starnbergersee, which is the largest of the lakes to the south of the city. Once, during my time here, Lauren and Mandy had come over for a weekend in September and we'd taken a motor boat out on the lake. I'd later heard that that was unusually late, so you can imagine our pleasure (and how good the weather was) when one of the boat owners rented us a boat out - It seemed that the owners were just carrying out some end-of-season tidying and housekeeping, but with the sun shining they were happy to make a few Deutschmarks as well. A third day, we visited the Andechs Monastery. This is famous (throughout the world) as the place where the Monks make beer. In fact, that isn't that unusual historically, but Andechs is still a working Monastery and the refrectory is famous for it's self service, on the principal that no-one should be waited upon by another. The beer was great (very strong and dark, in the case of the Doppelbock), but we retired to the Stuberl to enjoy Bavarian waitress service and eat some excellent Bavarian food (as we had, the last time we visited), plus another couple of beers. We then walked down the 'mountain' to the town of Herrsching (A bus takes you from the S-Bahn station to the monastery, if you don't fancy the walk), which is on the Amersee. Sadly, the weather turned a bit cold and grey by then, so we headed back to town and had another Pizza at my old haunt. We also took an afternoon trip to Ismaning, the small town north of Munich, we'd live in. We were amazed at the speed of construction along the railway line (which runs in a tunnel under the town - the station is below ground too), but the majority of the place was the same, peaceful, attractive town we lived in 7 years before. Best of all, the curry house still does great curries, served with Weissbier! After a quick visit to the Nymphenburg palace (By tram, to ensure we got maximum value from our tickets and to please Ryan! ), the final stop on our whistlestop pilgrimage to our old haunts was the infamous Hofbrauhaus. Not infamous for our behaviour after a night there - although I may one day recount one or two of the tales I have from there! - but for Hitler's use of the establishment as a meeting (and troublemaking) place for his early stormtroopers. Happily, everyone is welcome in the Hofbrauhaus these days and, although lots of my colleagues eschewed the place as a tourist trap in my days there, you usually find yourself sharing a table with locals, out of town Germans, Japanese (those who get past the door! Many just enter, take a photo and leave - their loss), Italians, Americans and all other nations, some passing through as tourists and others long (or as we'd been, short) term residents. It was fantastic to go back and see Munich. I felt quite homesick for the place, which was not surprising, but I didn't (as I secretly feared I may) feel disappointed. The parks, the buildings, the beer and, luckily in October, the weather were all wonderful and the excellent public transport makes visiting Munich on a short break a pain free experience. Mandy's sister and her family had been living in San Francisco for some time, so we decided to take a trip to see them. We decided to try and tie the journey in with a trip to the Grand Canyon, but as you'll read here it become something of an epic road trip! 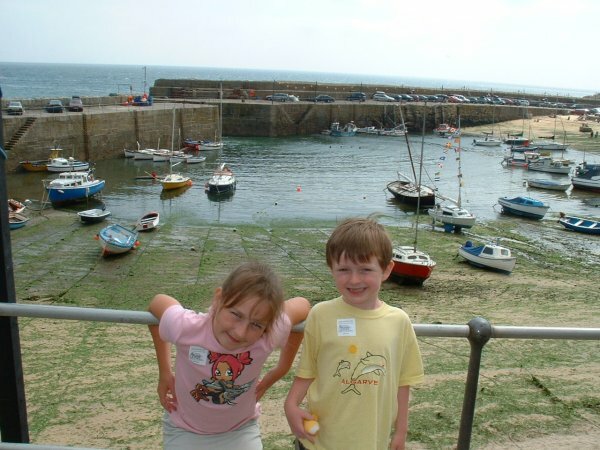 In 2003, we had a great week in a Caravan overlooking St Ives Bay in Cornwall. The weather was outstanding and we visited the Eden Project and Geevor Tin mine. Lauren and Mandy also visited the Lost Gardens of Heligan, whilst Ryan and I visited the local model railway. 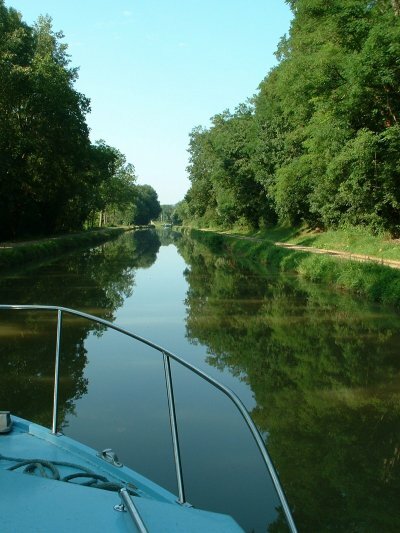 We decided to have another boating holiday in 2004, this time picking central France (we motored as far as Auxerre) in the hope that the weather would be drier and warmer than it had been when we boated in Ireland. Overall, it was, sometimes too warm, although the water kept things a little cooler. We travelled along a canal, which paralleled a river, but this meant there were many locks to take in and we were constantly frustrated by the French habit of closing for 4 hours in the middle of the day, meaning we rarely got use our enforced lunch halt to grab some excellent French food. We had a good time, but the number of locks did become a bit tiring at times. We also managed to break the ignition key off in the lock on the last evening, which was a worrying moment, but we managed to restart the boat and someone came out the next morning and replaced our key anyway. We thought of going to Japan for 2005, but the cost and the fact we left planning it too late, put an end to that idea and so we decided to return to a hotel we had visited a number of times in 1990s in Kirchberg, Austria. Having never spent much time in the moutains in the Summer, it was an experience we were all looking forward to. We'd enjoyed our holiday in Brittany some years before and (after an expensive winter holiday) we decided to return in August 2006. The weather was a bit disappointing this time, but we still had a good time, based at a campsite near Dol De Bretagne. For years Mandy had want to go to Scotland and (aside from two trips to Glasgow on business) I had never been there either. I really didn't fancy driving all the way to the Highlands, but managed to find cheap flights to Prestwick from Bournemouth (near to my parents' home), so with scant regard to our carbon footprint (Sorry...) we flew up and picked up a rental car at the airport and drove to our rented cottage in the tiny village (Hamlet really, if Scots have hamlets) of Lochaline, right on the Sound of Mull. We visited Loch Ness, the isles of Mull and Iona and Fort William during our week in Scotland, passing by Loch Lomond and through Glencoe as well. Our holiday diary is here. For a change, we decided to have a hot, sunny holiday in 2008. We consider Croatia for a while, but finally decided on Amalfi, not least for the views from the hotel, shown in the brochure. Fortunately, we weren't disappointed as the Amalfi Coast proved to be a wonderful place to visit. Due to a friend's wedding, we ended up in Cyprus for our 2009 Summer holiday. At the height of the Summer, it threatened to be very hot. You can read how we got on on this page. We went back to Brittany in 2010 as we really couldn't decide where to go and both Lauren and Ryan were enthusiastic about the suggestion of Brittany. We rented a 4 bedroom house in a small village near St Breuic and got to see a part of Brittany we'd not see before. You can read more and see some photos here. Mandy had long wanted to visit the island of Madeira and as it offered a chance for me to dive too, we went there in August 2011. It proved to be a great location for a holiday. You can read about it and see some photos here. For 2012, we decided to venture to the Caribbean, where only Lauren had been befir. We booked a trip that was to give us three days in Havana and seven in thr beach resort of Veradero. In 2013, we ended up heading to Mauritius for a week, with a short stop over (3 days) in Dubai on the way home. 2014 saw us stay closer to home - Would it prove a disappointment? After some ummming and ahhing, we decided on Malta for 2015. See what we thought here. Read how it was for us, here. Mandy and I had both long fancied seeing Petra, 2017 was the year we got around to visiting Jordan. After the wonders of Jordan in 2017, Mandy mentioned that she'd really like to visit the Alhambra in Granada, Spain. After a bit of research, I suggested we combine it with a visit to a few other places and our 2018 holiday turned into a bit of a roadtrip! Read how it went, here.